If you are a woman in business, are you willing to do whatever it takes, provided that it is legal, moral and injures no one, to double your clients, income or business in the next 90 Days? 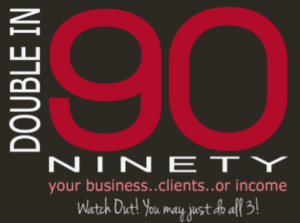 Is it actually possible for women in business to double their business in 90 days? The answer is yes, I am about to show you a proven, step by step process that you can use to double your income, live the life that YOU want to live and design your own future. I will coach you on how exactly to make this empowering change. Chasing the money is critical, because, without the cash, you have no business. But I do not want you to get caught in the cycle of chasing the money and never looking up and enjoying your life. And I can tell you that I have personally have used this system to double my income and the income of my coaching clients. As your business mentor, along with business coaching and confidence coaching, you will see that using your female power and boosted confidence will allow you to become a woman leader in your industry. Let’s do it! The foundation of success is in your mind and in your body. There is no need to struggle and strain to have the life you want. By using the latest research in quantum physics, neurology and biology, and applying the correct principles, we are able to create and attract the life we want. I think you’ll find this article helpful. So the question then becomes, is it even possible to double my income in 90 days? Doubling results is much easier than you think. The key is changing your mindset, in other words, how you think and what kind of actions you take. The next step is to visualize a successful goal that you have in mind. You know that what you put your attention on you get more of, what you focus on with intention has a way of manifesting into your life. If this sounds crazy, think about the next time you want to buy a new car or plan for a holiday. All of a sudden you start to see that same make and model and even color of the car you want to buy everywhere on the road when before you never noticed how popular that car was. This also holds true for your goals like doubling your income. When you focus and think about the goal, then that becomes the overriding focus of your life. You will start to see business opportunities that you never saw before. Once you get momentum happening then everything starts to snowball. Its is much harder to bring something to a stop once momentum has kicked in. Your goal in the next 90 days is to start to see opportunities everywhere. Up until now, you may not have noticed things that you now notice today that could help you double your income in 90 days. Maybe it’s a conversation with someone who might have a better job offer, or a potential promotion or a new project that you can take on. Whatever it is, you need to be ready to see it, they say business opportunities are everywhere, it’s only when we are ready to see them that they show up in our field of vision. Before explaining how to double your business, I would like show you the penny model. You can clearly see how results can double in a very short amount of time. Imagine that on day one you’ve got one penny. On day 30, you now have two pennies. By day 60, your one penny has grown to 4. Within 3 months or 90 days, you’ve got 8 pennies. After a year, that one penny is now worth $40.96! It has far more than doubled. And even if for some reason you didn’t double would you complain if it was only worth $1.28 or even $3.20? So how does that translate to business? Let me explain. The penny represents the daily vital actions of women in business. For example, you call 100 people, speak to 20 of them, schedule 5 appointments and get one sale. By increasing your calls on a daily basis for the next two weeks to reach another 10 people each day, you will have another sale at the end of two weeks. Or maybe you currently schedule only 3 appointments per week and it took you 50 phone calls to get those 3 appointments. By doubling your phone calls to 100 per week, you would now have double the appointments to 6. Given your close ratio, you could easily double or triple your business within a very short time. Even if you believe that you can’t double your actions, (and that’s all about your internal beliefs) what would happen if you increased your actions by just 10% and added intentional thinking? A 10% increase in effort and confidence can make a huge difference! For women in business who average $52,000 in sales per year, 10% would mean an additional $5,200 or just $100 more per week. This might even be a case of up-selling or even asking a good client for a referral. The penny model is a very simple way for women in business to see how quickly activity really adds up. All you need to do is to keep an open mind and look to the possibilities instead of limitations. Of course, a proven intentional program, a plan to track your success and a success partner probably would be a great idea! And while activity is critical, it’s not all about activity – it’s about energy, confidence, and intention applied to the correct activity focused on the correct key indicators. The basic formula of doubling your business is very simple. You must know what you sell, who you sell it to and how to sell it. For some women in business, sales are challenging. Sales can actually be fun when you create events that are collaborative in nature and that allow you to speak to an audience that is a perfect fit for you. Collaboration for women in business is important because it elevates both businesses. Everyone wins. The way that business is tracked or measured is also very important. The concept of key indicators is not new. Most women in business already have a way that they are tracking their success. When you really look at how you THINK about your success, you’ll probably find that you unconsciously measure your success with something other than actual cash. Maybe clients, the number of appointments, etc. And when things are going well, you feel great. When that number is not moving upwards or is flat, you begin to wake up in the middle of the night with worry “I really need more appointments” or “I have to add a new client”. This is the real key indicator of your business and it is actually tied to your consciousness. You are changing it and influencing through the use of your energy. And once women in business really get this concept, it completely changes their business. It can change yours too! Join me today, allow me to be your business mentor and coach. 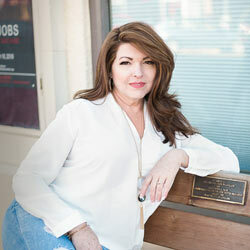 We will work together using our feminine power and boosted confidence to enhance your business. You will reach goals and become a successful woman in business in no time. Yes, you CAN do this in the next few months and you’ll hear some of my client success stories. Here’s how to claim your ticket: go to www.dawntodd.com/doublein90freewebinar and register to save your seat!